You are here: Home » The Mt. Fuji Rivalry: Which Side Is Better? The Mt. Fuji Rivalry: Which Side Is Better? “Our side of Fuji is better,” she tells me over a hot bowl of ramen. 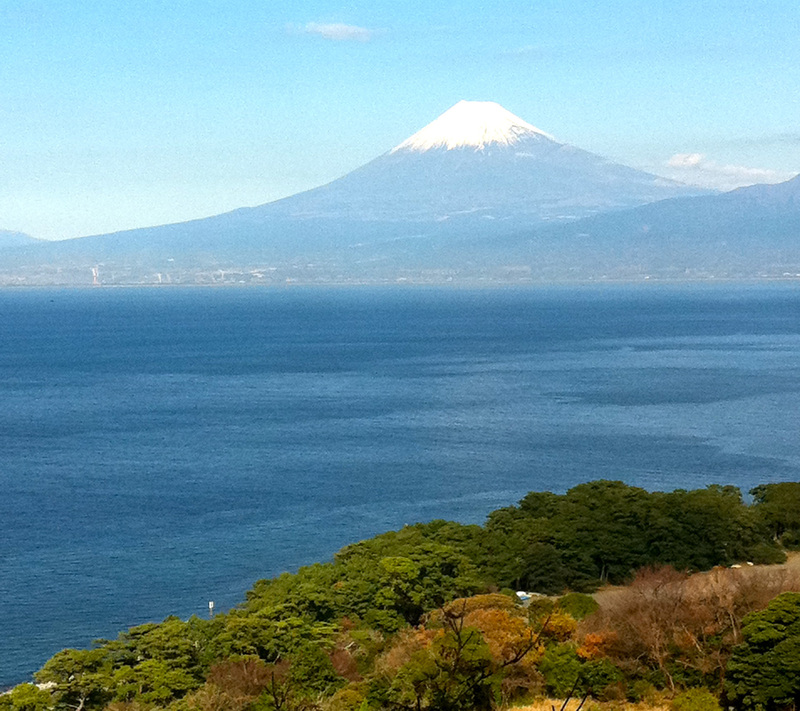 There’s a gentlemanly debate between residents of Yamanashi and Shizuoka about which prefecture has the best view of Mt. Fuji. The border of the two rivals runs straight through of the iconic landmark, which recently became a UNESCO World Heritage site. When you live in Yamansahi, you grow used to seeing Mt. Fuji every day. 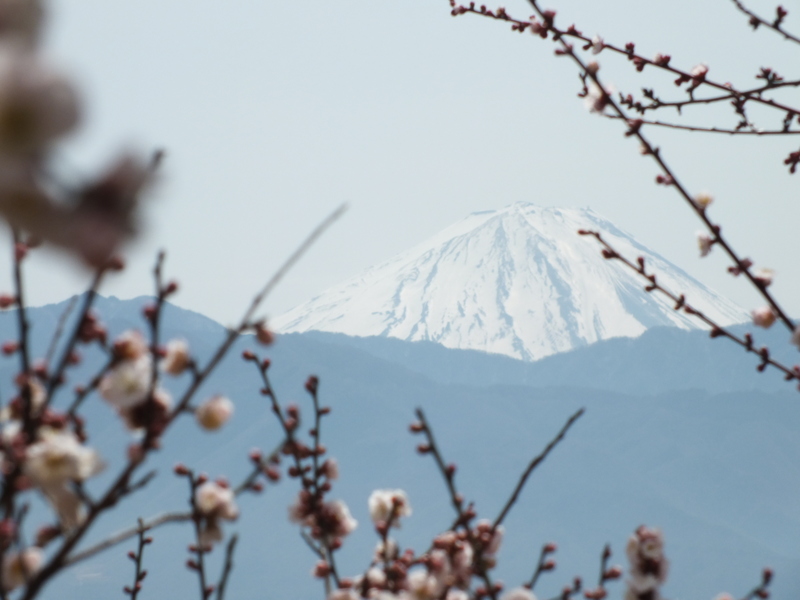 It might be a source of inspiration to poets and painters, but in Yamanashi it’s just a fact of life. And a limitless well of local pride. “Did you see Mt. Fuji?” My students asked me on my first week in Japan. For the next week I looked for Fuji but didn’t see anything except the bowl of mountains surrounding the city. Fuji was hidden behind a thick net of clouds. “I still haven’t seen it,” I told them the next week. When I checked again the next day, Mt. Fuji was lending its wabisabi (Japanese art aesthetics) to the vista over local Maizuru castle. Stunning. So I go, and see the whole thing for the first time. It wide. The entire mountain is the size of a city. Climbing from the absolute bottom would take at least two days. I’d heard about the second peak of Mt. Fuji from everyone, but in all the travel brochures you really can’t see it. (Maybe the pictures were taken in Yamanashi.) I still hadn’t quite believed the hump was there until seeing it near the border myself. I didn’t think it was so bad. But then again I’m not from Yamanashi. On our trip to Shizuoka, we headed to Gotemba Outlet Mall. It’s a popular–and expensive–outlet my more fashion-conscious students make yearly pilgrimages to. On the way there I see a strange car. We follow him, and I’m beside myself when he pulls into Gotemba. 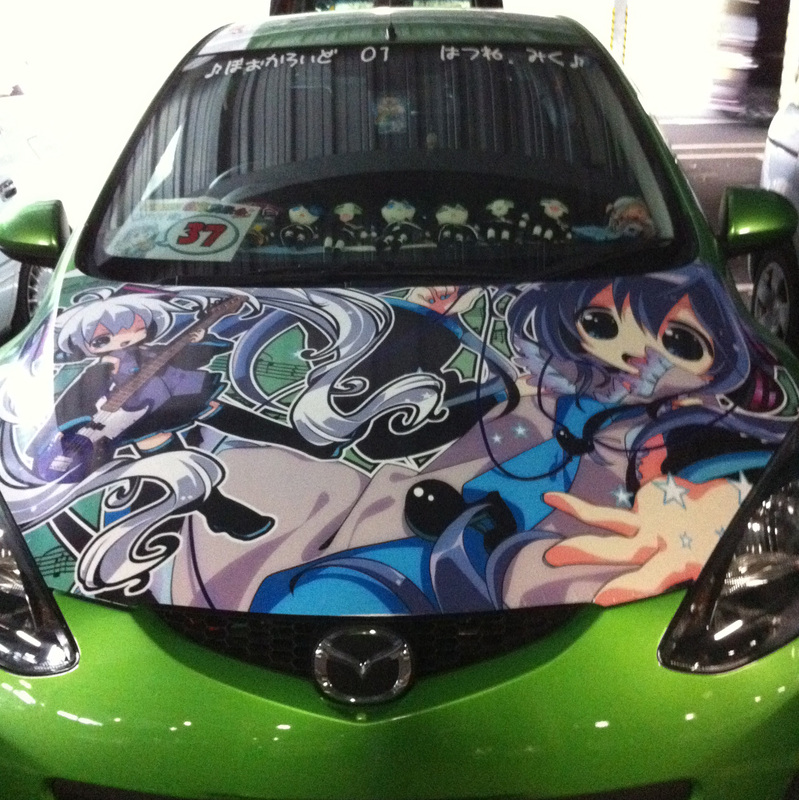 My first Itasha. “We must park near him!” I declare. We find an inconspicuous space two rows of away, but with a good view. Score. We watch him, my anticipation mounting. “You know, I bet he doesn’t have a girlfriend,” she comments. He gets out. He’s 100% grade A otaku. But then the passenger doors opens, and a stunningly cute girl in a miniskirt steps out and smiles at him. 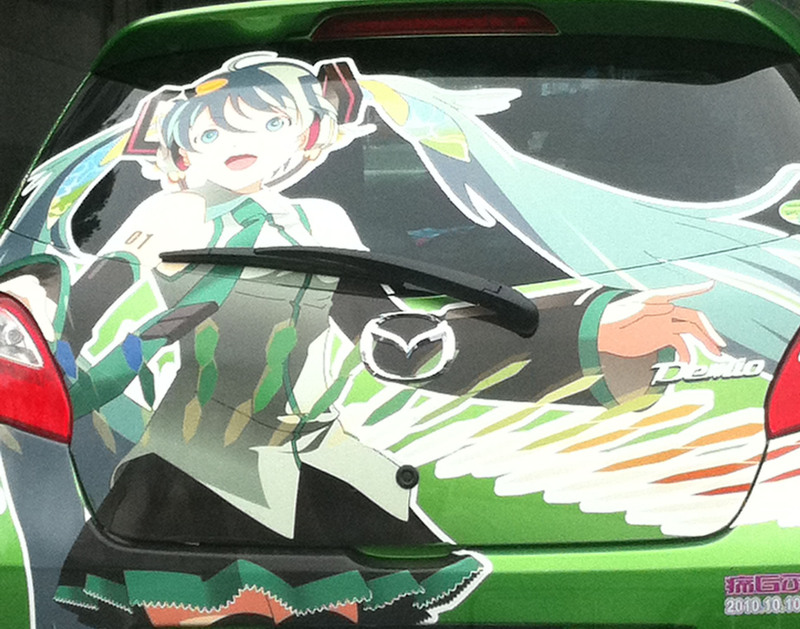 Our jaws drop and we stare like stunned tuna at this otaku’s hot girlfriend. We shop. I think about buying one army-looking jacket, but decide I don’t want to be mistaken for military. Some have a bad rep in Japan. I mostly just follow her around, getting bored until I finally see the view of Mt. Fuji she had been telling me about the whole way there. 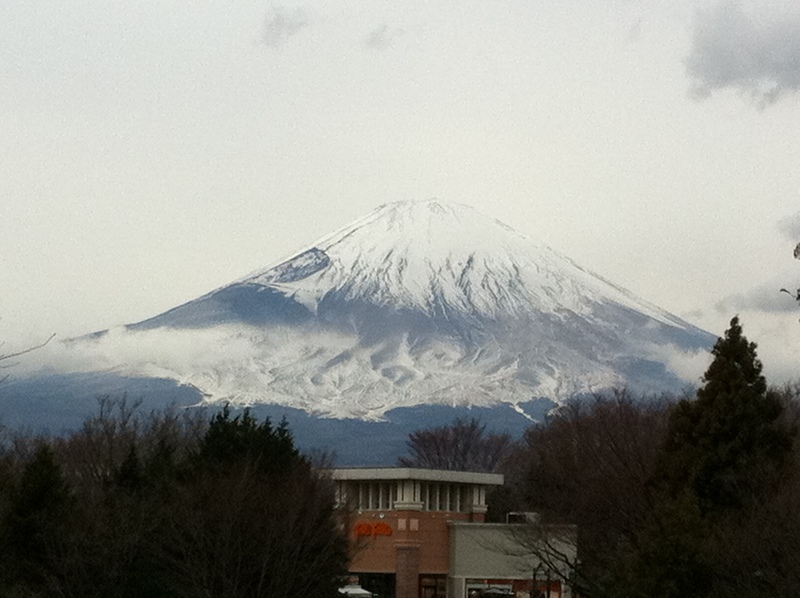 “Gotemba does have a great view of Mt. Fuji,” she admits. “Better than Yamanashi’s?” I ask. Well, now that I see it, I have to disagree. It looks a heck of a lot better than any of the views I’ve seen from Yamanashi. That said, after seeing Miss Kisa‘s pictures from lake Kawaguchi–in Yamanashi–I’ve got to say these are the best views of Fuji I’ve seen. But until I see it with my own eyes, I’ve got side with the enemy, traitor I am. Question of the Day: You’ve seen the pictures. Which side do you think is better? I like the Shizuoka side. Who really expects mountains to be symmetrical? This is super interesting, great article. Shizuoka is my favorite too. We still traveled up to some of the stations, but there was way too much mist to see anything at all. It was eerily beautiful though, seeing shrines and traditional stores up in the mountains, obscured by a rolling wave of fog. A memory that I won’t soon forget. I always appreciate the fog. It reminds me of old ink paintings that can highlight Japan’s often mountainous vistas. 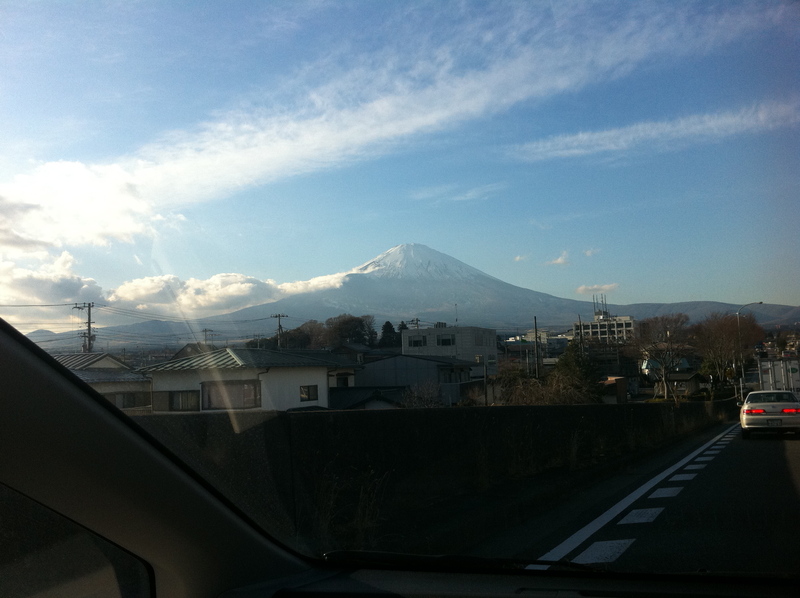 Fuji san, from Yamanashi side, has a poetic tender and symmetrical beauty like a fragile china, just admire don’t touch. 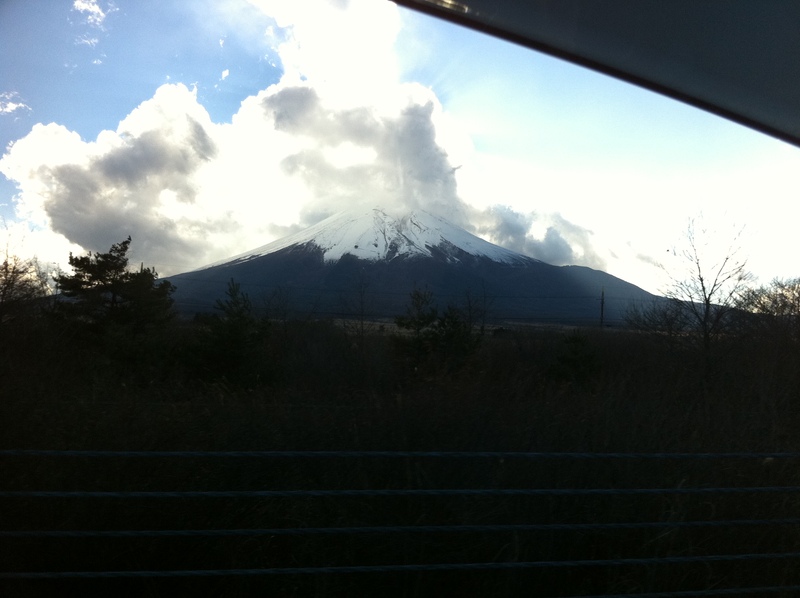 While from Shizuoka side, it looks more rough, imposing and challenging.